I am often asked how much I spend on groceries per month. One thing is for sure, I know that if I don’t budget a fixed, and I mean fixed, amount, it will quickly become a black hole! Families with the income range of $50,000 to $90,000 per year should spend a recommended 11 to 14 percent of their income on groceries after taxes and tithe. For example, a family of 4 to 6 with the income of $75,000 per year should have a modest grocery budget of approximately $500.00 per month! That seems near impossible, but it can realistically be done! Can an average size family spend less than this? Absolutely – with a lot of time and effort! There have been many dinners that I have pulled off for $4 – $5 total, and even less. With coupons, rock bottom prices, meat markdowns, and free produce from my neighbor I am always striving to make dinner as cheap as humanly possible! However, these are props and variables that can be time consuming and are not always at my fingertips every week. I realized that depending on these variables to come together turned dinner into an inconsistent “hit or miss” approach, which left gaps. This set me up for “the five o-clock stare” into my cupboard which then led to the fast-food money pit or a last-minute grocery run. One single fast-food bombshell would cancel out the savings and effort I had put into coupon matching. As my family grew and I went back to work, time became critical which forced me to think realistically instead of idealistically. Dinner had to appear every night, come rain or shine, dirt cheap or not. I finally accepted that the best tool I had in my grocery-saving arsenal was not my file cabinet of coupons or cupboard full of bargains, rather it was consistent, realistic, practical dinner planning. This kept me on a predictable plan that I could count on and know would stay within the “fixed” grocery budget amount. Using recipes that were already budget friendly, then building a menu based on the weekly grocery store sale flyer, were two variables that could consistently translate into a working, frugal menu from week to week. If I had extra time in a given week, I could dig in deeper for further savings with coupons, bargain hunting, and stockpiling. So what is a realistic budget amount for the cost of one family dinner? At E-mealz we believe that a do-able, projected amount that can feed a family of four to six is approximately $11-$12 per dinner. This totals $360 for the entire month for dinner groceries. This amount is based on today’s current market’s grocery prices and frequent sale prices. If you have never written and followed a dinner plan from week to week, take on the challenge this year to try it! Having a dinner plan translates into a grocery-spending plan that is key to making your overall budget consistent and fixed. Gain family time, gain some sanity, and gain control on your spending. With a realistic and predictable approach, your very own dinner table awaits you and is a money saving tool waiting to happen! Go to E-mealz.com and click on “subscribe now”. Pick the store you want a meal plan and grocery list for. Use code FAITHFUL at checkout to get 15% off. Come back later today to enter to win one of four 3-month meal planning subscriptions from E-mealz.com! Jane DeLaney is the Founder and CEO of E-Mealz, Inc. E-Mealz provides a simple on-line meal planning system based around Jane’s own frugal organization structure and delicious recipes that the whole family can enjoy. Visit E-Mealz for more information, and connect with Jane at her blog, Making Time For Family. Thank you so much for posting this! You made me feel so much better about my efforts to save money for my family. I thought I was failing miserably and spending too much, but reading this benchmark made me feel so much more at ease. We’re actually doing pretty well, relatively speaking! Thanks again for peace of mind! Is this literally only a budget for groceries, as in things you eat? We lump all our Walmart/Sam’s Club expenses here, which includes paper towels, cleaning products, home scent things, toilet paper, etc. Our budget has always been high compared to other’s I’ve read, and I feel like we eat appropriately. The only thing I can think of is that others have a separate category for household supplies or something? Michelle, I’m always thankful when my readers are helped by something they’ve read on Faithful Provisions! Thanks for letting me know this post by Jane encouraged you! Sarah, I think that what Jane is talking about here is specifically what is spent on actual food items. If you’re including other household items like what you mentioned here, then yours will no doubt be higher. I wanted to point out that it says, “$360 for the entire month for DINNER groceries.” To me that doesn’t include breakfast, lunch, or snacks which can add significantly to your monthly budget, especially if you are eating lots of fresh produce. I noticed the same thing. And especially being a sahm and homeschooling I have 6 people to feed breakfast, lunch and snacks every day. Then we travel alot for sports, so I need to pack snacks for that so we stay away from the concession stands. Maybe I am closer to being on track with my budget then I thought. I used to coupon like crazy (about a year ago) and we saved a ton of money. But also during that time my husband and I put on weight. Almost everything I bought was processed foods because that’s what was on sale (BOGO) and that’s what the coupons were for. In January we started eating Paleo (grain free, processed food free) and we only eat organic/grass fed meats, vegetables, some fruit, nuts, anything coconut……Do we spend a lot more? YES! But my husband lost 68 lbs. in 4 months and I lost 14. We feel better and look better! We cut expenses in other areas and realocated it to our grocery budget. Example-Cheaper rent, no cable, no eating out, drive cheaper cars/or no car payments, ect. I agree with Stephanie. I have recently become vegetarian and concentrated on buying organic, fresh produce rather that a lot of the processed food. My ability to effectively coupon is diminished, and I am definitely spending more on food, but I feel it is money well spent. I do still try buy food that is in season or on sale and I am grateful for all of the great tips on shopping and stocking up provided on Faithful Provisions. Thanks! Thanks, Kim! I’m grateful that you have found tips you can use here! We use Crown Financial Ministries as well and it states that we spend too much on groceries. I coupon and look for sales, but we eat out every Friday night. We do not spend any other money really for entertainment, so we look at it as our entertainment budget. We eat breakfast, lunch and dinner at home and I pack my husbands lunch every day. We eat well and I buy lots of fruits and veggies and when we eat meat I only cook 2 chicken breasts, steaks, pork etc… for our family of 4, it keeps the cost down and keeps us from eating too much. I spend about $600.00 in groceries (not including paper products) and about $160.00 a month on eating out. I try to cook as much as I can from scratch. You just have to find a balance. Love these articles! Balance is key in all of life! Thanks, Lora! I am so happy that I discovered emealz thru your site. It has made my life so much easier. As a working mom I no longer have the “what’s for dinner” stress. And its cut my grocery budget in half! Thank you so much! That’s great to hear, Cathie! I have always planned out my menu for two weeks at a time (when I get paid) and then made my grocery list off of that. Our family of 4, for breakfast lunch and dinner, spend about $400/month. That includes eating out maybe twice a month at a place like Taco Bell or something. I found that the biggest saver was making sure I planned some meals that could be made in a hurry when something unexpected came up. That kept us from going straight for the fast food. It takes some planning but is well worth it. I have always thought our grocery bill was too high but after reading this story, maybe we are doing pretty good after all. Thanks! Summer, did you use a book or a website when you first started implementing your 2-week menu plan? i believe we spend too much on groceries and that we can trim some of that down. we’re a family of 4 (2 kids under 6–so they don’t eat that much) and we spend $600-$700 per month on just groceries! I hate the grocery store. And I noticed I spent way too much when I went everyday so that’s what motivated me to start meal planning. I started with a week for some time then was able to move to two weeks. I didn’t have any books. I was just very knowledgable about what it cost for the items in my recipes. I even went so far as to write all my regular meals down so I had something to go by when I got stuck deciding what I wanted to plan. Since my post my bill has gone up slightly with the raise in meat prices, but I’ve managed to keep it down most weeks. My biggest downfall is I don’t live even remotely close to a big box store to stock up on stuff. I stick to my list and don’t buy tons of junk/snack food that is prepackaged and we eat leftovers. I’ve even gone so far as to refuse to cook when my refrigerator is full of already cooked meals. It’s saved a ton of money in waste. I found recipes that I can use my leftovers for too. Like roasting a chicken and using the leftover chicken in quesadillas or chicken noodles. Like Stephanie, I was couponing and buying everything coming and going that was super cheap. Then I realized a lot of it was processed. I am still ALLLL about couponing, but now I focus on saving on the essential (both food items and paper/personal care/etc) stuff as much as possible and eat as unprocessed as we can. I also use a lot more “health” food or organic coupons to make it doable. I upped our grocery budget from about $40-$50 to $60 a week now for 2 adults, 4 year old, and 9 month old. (That’s for everything, not just food) We eat better and still save! Faithful Provisions is my go-to for couponing and eating like we like to! Oh, and my hubby takes his lunch everyday and I am home with the kids and work from home. We have more food than ever (compared to getting hardly anything for $100 at Wal-mart every week BEFORE discovering couponing). Thanks for the article! If we spend an estimated $360ish on dinner meals, then we have about $140 left for breakfast and lunch. This is about $2.34 for each breakfast and lunch. With or without coupons, what can we feed 4-6 people on that will cost that little? I used the E-mealz service for a few months, but when I realized it was around $70 each week JUST for dinner (and my weekly budget was $100), I cancelled. Coupons and matching sales for meal prep (freezer meals, hello!) are the best way to go. Basically, not only tell your money where to go (Dave Ramsey, hehehe), but also plan ahead for the meals! I keep debating about whether or not to try e-Mealz. I already stockpile (which is the biggest key to saving money, even over couponing) and use coupon matchups. I plan my dinners, and we eat at home/pack lunches. 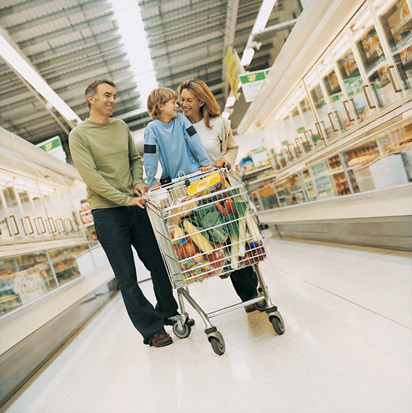 For three adults and 4 kids ages 1 1/2 – 9 I average $450/month on groceries. We keep all other items in different categories – kitchen consumables, laundry supplies, cleaning supplies, etc. I guess I’m just hoping to be lazy and have someone else do the plans for me! But I also want to eat well and from scratch, as I don’t use processed/packaged/frozen meals. Does anyone have advice about whether e-Mealz is for me?? Can you tell me what a sample day or two menu might be that only comes out to $450/month?? I truly am curious. : ) I shop sales and use coupons and I cannot get below $200/week. I do buy a significant amount of fruits and vegetables as I believe we are to eat what God has given to us to feed the bodies He made. I really don’t know what others are eating at $115-$125/ week to feed so many…if someone could educate me, I would be thrilled! Maybe I am missing something?? E-mealz will probably push you out of your budget and much of what they use is packaged soup and seasoning packets. They incorporate a good bit of vegetables and meat, but get ya with the packaged items. Meal planning and I have a love hate relationship! I totally understand!! Elaine – There are two MAJOR components to getting the budget way down. 1. Meal Planning around sales 2. Stocking Ahead. If you will plan your meals around what is in your pantry/fridge/freezer and what is on sale that week you can see a big difference than meal planning and THEN shopping. Couponing alone will NOT get your budget down. You must first master meal planning and stocking ahead, then incorporate coupons as needed. Also, since we eat a lot of produce and unprocessed foods, I use coupons mostly to bring down costs on toiletries and cleaning products. I hope that helps! Lastly, I would recommend you go to my Start Here Guide here and then if you want step-by-step instructions on how to drastically reduce your budget, you can try my book Saving Savvy. It is in paperback and audio book format. I really hope this helps you out! And thank so much for the great question, you are not the only one who has it. One big help for me is buying in bulk. We (finally) have a WinCo Foods near my house north of Seattle and it is so helpful. But before that I got my flours, oatmeal, rice, honey, etc. at a local health food store or Fred Meyer (which is part of the Kroger family – we don’t have Kroger up here). Then just like the others said – match coupons with sales and stock up when the price is as low as it gets. I only get one paper, though, because I just get overwhelmed and don’t have time for extreme couponing. I plan my meals for roughly two weeks and also have a husband who is a magician with leftovers and pantry items. He can make a meal out of just about anything! my best advice is get a good freezer and use it well. Frozen fruit/veges are so much better than canned and can be stockpiled. I would also suggest you create your own freezer meals. It just means making bigger batches of your families loved recipes and freezing the extra. So nice to have on hand when time/cash is short – and better for you too! Doubling or tripling recipes are the way to go – you only clean up once and have lots of meals to show for it. Kelly has a great section of freezer friendly recipes! Jennifer – You might want to just plan from my Weekly Meal Plans. I post them every Sunday for the following week. They include my personal meal plan, a seasonal meal plan and a few big stores to choose from. I hope it helps you out! Let me know what you think! Thanks, I will do that Kelly. I also follow a local Christian blogger who does very similar work as you, and she has such helpful lists for the sales at our local stores. Since we don’t have Kroger, Publix, or Harris Teeter I am often jealous of some of the deals you post! Jennifer – I find that many of the seasonal items can be found at most grocery stores, but maybe they are just on off weeks. Keep an eye out for your deals though, check your stores coupon policies and you might still be able to snag some great deals! Hi!! I just found your website and I am excited to try everything!! I also use E-Mealz. I have a family of three, with my husband and daughter being bigger eaters than me. I have found that E-Mealz saves me a ton of money. Just having a “plan” for dinner for every night is priceless. My daughter takes karate anywhere from two to four nights a week (depending on homework), I work a full time job (with Wednesday as my late night, get off at 7pm) and my husband recently started his own business. Prior to using E-Mealz it was just too “easy” to pickup something on the way home. That something was almost always “fast food”, expensive and terrible for your health. With E-Mealz everybody can cook (did I mention I was the only cook for almost 15 years), the meals are that simple. I spend less than an hour a week going over the menu, making substitutions where necessary, checking for coupons that correspond AND shopping!!! You can’t beat that with a stick, LOL!! As far as breakfast, we have three meals that we repeat (because we love them and nobody wants to think that hard at 6am) that are cost efficient and simple to fix. For lunch we alternate between leftovers, chicken, tuna and egg salad (yeah, I know it sounds boring but we try different spices, breads, wraps, crackers, etc. and it works for us). We are below the $500 a month mark and we usually eat out once a week. I LOVE E-Mealz and their customer service ROCKS!! Terri – I love the ladies over at E-Mealz! They are great at what they do and I am so glad you like their meal plans. Karen, I feel your pain! I have all the same food intolerances (none of mine are true allergies) except for the tree nuts and fish. However, I have found a way to significantly decrease our family’s food budget. A few years ago we were spending almost $200/wk on groceries alone, for just the two us, which is absurd! We established a new budget of $100/wk (even with food intolerances), which was really hit or miss for many years until I found Kelly’s step-by-step guides. For the most part I just meal plan and stockpile good deals with any leftover food budget money. I rarely coupon. 1. Meal Plan…for every night’s dinner! Start with what you already have in your pantry and freezer and create meals around those items. 2. Simplify your meals, at least for a few weeks, to free up some of your grocery budget for stockpiling. Ideas: Fried rice with frozen veggies (omit soy sauce & use more ginger and garlic), grilled chicken with quinoa and carrot sticks, beef tacos with spices from your pantry and black beans, etc. 3. Buy your produce and meat from a big box store that puts out sales ads like Kroger or Safeway. Arrange your meals by what’s on sale that week and what you already have on hand. I can almost always get better pricing on organic produce at the grocery store than WF anyways. 3. I buy gluten free grains/seeds and their flours from the bulk section of my health food store: millet, quinoa, rice, teff, amaranth, etc. I particularly like millet because it is only about $1/per pound and very nutritious! Although, depending on how serious your allergies are this may not be an option due to possible cross contamination. 4. If you’re brand loyal check online at amazon for bulk pricing or possibly contact the manufacturer directly. 5. When possible, make your own GF & DF items from scratch: bread, muffins, rice milk, coconut milk (google “Mark Bittman’s coconut milk”). Make extra and freeze it. This really saves money! 6. Is Whole Foods your only option? I had to stop shopping at Whole Foods because their food was always significantly more expensive than a local health food chain around here called Vitamin Cottage/Natural Grocer. I only go to Whole Foods if something is on sale and I have a coupon (theirs or manufacturer’s). 7. Lastly, Mambo Sprouts puts out a lot of natural/organic/specialty diet coupons on their website. I’ve been able to really stock up on some GF items when I pair their coupons with sales. Hi! I have a question. The free download called the Provisions Price List, are these prices listed as the best prices to buy at? For example, if I find apples for $1/lbs. then I will know that that price is a good deal to buy at. Is that what the price list is for?? I was confused because under bananas it says $0/lbs. Can you really get bananas for free?? hello all, I am new to this website and was wondering if anyone had any advice for me? I am a stay at home mom with two small children. My husband makes about $41-42,000 per year and we are literally living paycheck to paycheck with just barely enough at the end of each month to skimp by. We have no debt other than our house and car, no credit cards, no student loans, etc., I can’t do much outside of the home because of the girls being so small but we have to figure something out. We pay our tithes every paycheck and I know by being faithful that the Lord will take care of us, but I also believe it is not His intention for us to struggle or do without. We have cut back everything we can and do not live outside of our means…….does anyone have any suggestions? maybe possible jobs in home that I might could look into…….Thank you in advance! Congratulations Jessica on being debt free and not using credit cards!! There are SO many families who are striving to get out of the trap of debt (including mine!) and it seems such an endless and discouraging battle. Dave Ramsey and his Total Money Makeover are helping my husband and I immensely, but we’re still $20,000 dollars away.